I have 2 in the front and 2 in the rear. I got these lights after I was T-boned by a motor scooter last year during the daytime. I have also had to brake suddenly countless times for stop-sign running, mindless basket bike riders, sending me over the handle bars twice in the past year. I am more afraid of other cyclists in Tokyo than cars, but I have noticed cars giving me a much wider berth during the daytime than before. Like almost a whole car width and that is on narrow Tokyo thoroughfares. Orfos are definitely a shot of confidence while riding busy streets. For off road riding at night on trails, I find the beam a bit short, but they work very well in conjunction with a spot light. Orfos let you see what is all around you on either side and fill in the disconcerting black gap that spot lights often give in front and side of the bike. No more tunnel vision. 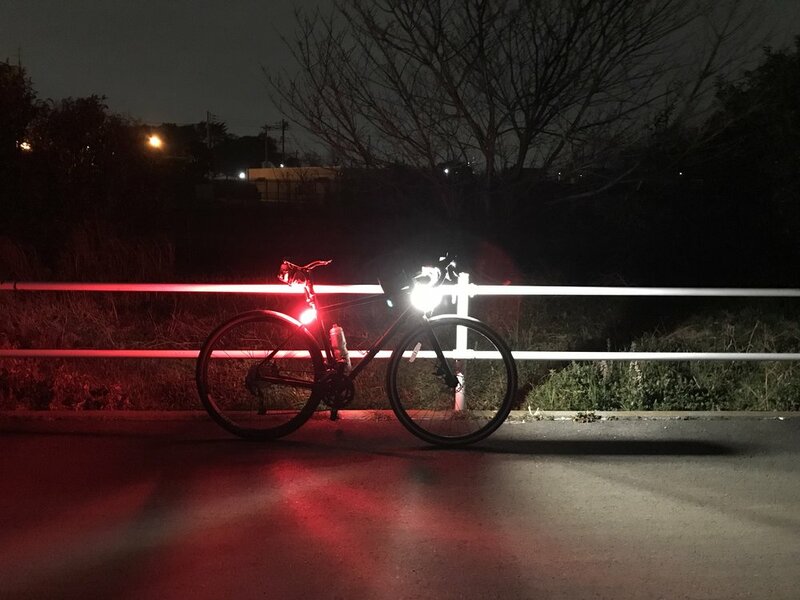 The rear light is so bright, I often feel someone is riding up from behind me because the light from the rear casts all the way to the front, as you can see from the side view photo. I recommend a 10,000 mAh battery for each set, if you have 2 in front and 2 in the rear. I’m not so excited how long the USB jacks are, but they are to keep the cables from wearing. Also, I have found that the lights will blind me from under the stem while riding off road as my head bobs from side to side with the trail bumps. The solution was to fashion a shield out of an old fender. This completely fixed the problem! Super easy to make and highly recommended. The grid in my photos is in centimeters. Lastly, you might notice occasional gobsmacked cyclists gawking at your lights as you pass by. Great lights! NOTE: I did mention that I bought these for daytime use as well. I have tried to take photos of these during the daytime, but my iPhone doesn’t cut the mustard when photographing bright objects during the daytime. Wrong wavelength I suppose. You’ll just have to take my word for it that you can be seen. All Work Copyright © Daniel Schallau, unless Otherwise Stated.